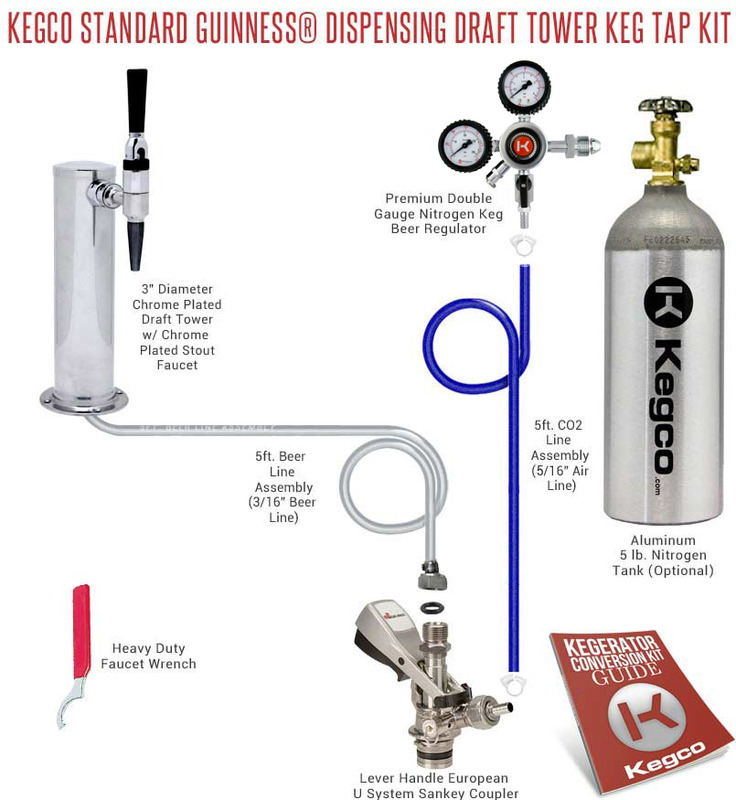 Thanks to Kegco's Standard Guinness® Dispensing Draft Tower Conversion Kit, you won't have to leave home to enjoy a cold glass of delicious Guinness® beer straight from the tap! Featuring a sleek 3" diameter chrome plated stout beer tower that will look great in any home bar or game room, this kit provides all of the high quality commercial-grade parts necessary to transform a compact refrigerator or chest freezer into a specially designed Guinness® dispensing kegerator. It includes all of the specialized equipment you need, like the European "U" system keg coupler required to tap a Guinness® keg, a premium double gauge nitrogen regulator, and a stainless steel stout beer faucet with restricted spout for that perfect cascading head! Unlike standard carbonated beer, Guinness® kegs must be dispensed using a special mixed gas blend. Once you have confirmed that you will be able to get the mixed blend filled locally, you can purchase your high strength aluminum alloy tank, or buy a tank from a local dealer. This European stout beer tower features a restricted spout that contains a tiny disc. The restrictor disc helps slow down the pour and allows the beer to pour properly to achieve the cascading head that stout beer is famous for. It has a stainless steel body and a black plastic nozzle.